That has always rankled Vancouverite Michael Hallatt. So much so that a couple of years ago Hallatt decided to open a store in the affluent Vancouver neighborhood of Kitsilano. He named it “Pirate Joe’s.” Hallatt stocked his new store by making frequent trips across the border to Trader Joe’s around the city of Bellingham, Washington. Hallatt spent over $350,000 on Trader Joe’s items, including Charmingly Chewy Chocolate Chip Cookies, Milk Chocolate Covered Potato Chips, Gluten Free Rice Pasta, and Tea Tree Tingle Conditioner. Hallatt marks the products up by a couple of bucks and puts them on the shelves of Pirate Joe’s, where hungry Vancouverites have been snapping them up. Which sounds like a decent business for Hallatt, and also a sweet deal for Trader Joe’s, which gets to sell a lot of its product in a market where it would otherwise sell nothing. But apparently Trader Joe’s doesn’t want Hallatt’s money. And now they’ve filed a lawsuit in Seattle claiming that Hallatt’s Pirate Joe’s business is infringing their trademarks. Why on earth would Trader Joe’s be suing one of their best customers? And what, if anything, is wrong with reselling products? That’s pretty weak, and in any event, if Hallatt is handling food improperly there are plenty of health inspectors – yes, Canada has those – that can handle that. TJ’s real concern isn’t about health and safety – it’s about their trademarks. Consumers shopping at Pirate Joe’s, TJ’s says, will be confused. Because the TJ’s trademarks are all over the items on Pirate Joe’s shelves, PJ’s customers will think that TJ’s is sponsoring the Vancouver store. And they’ll be mad that they’re being charged a couple of extra bucks for TJ’s items. Do you think these look alike? If you do, you need new glasses. If, on the other hand, your vision is good, you may notice that the window display has been modified to read “Irate Joe’s.” Hallatt did this after TJ’s sued him. He also painted a message to his consumers on the sidewalk outside the front door: “Unauthorized. Unaffiliated. Unafraid.” In short, no reasonable person is going to confuse these stores, or believe that TJ’s is sponsoring Pirate Joe’s. Instead, PJ’s is reselling TJ’s popular merchandise. The ordinary rule of property is that once you purchase an item, it’s yours to use as you like. Or, to resell. This concept is the basis of a great American (and Canadian) institution: the yard sale. And more recently, eBay. Now, reselling on a larger scale is also possible. Sometimes resellers are authorized by the original manufacturer – as in the case of authorized Apple computer resellers like Peachmac. Sometimes they aren’t, as in the case of Pirate Joe’s. But our rules of real property (that is, tangible property, or as The Economist once called it, “things you can drop on your foot”) permit reselling as a general matter. Does intellectual property law offer a different weapon to Trader Joe’s? Not really. Trademark law doesn’t confer on trademark owners the right to control subsequent unauthorized resales of genuine products, at least if the reseller doesn’t alter the product in a way that confuses consumers. PJ’s doesn’t do anything to the TJ’s products other than truck them across the border in a white panel van. If TJ’s has the right to stop PJ’s from reselling their products, then any trademark owner might assert a similar right. Ford could sue Carmax for reselling Fords. Prince (the sports gear company, not the musician) could sue Play It Again Sports for reselling Prince tennis racquets. And if this were true, a trademark law that is aimed at preventing consumer confusion will be preventing something else entirely – competition. I live nowhere near Vancouver but this story has gained wide coverage so I've seen it before. I like Trader Joe's a lot but the only one hurting the Trader Joe's brand is Trader Joe's with this lawsuit. Ah but Carmax is a very different-sounding name than Ford, and Play It Again Sports is a very different sounding name than Prince (or any other company that they resell). Pirate Joe's still is in red lettering, and if all it sells is Trader Joe's products (where as Carmax sells used cars other than Fords, and Play It Again Sports sells used sports equipment other than Prince), then I can see the confusion. Plus I wonder if there is something about intent or use of the product before reselling. You can't, of course, sell "used food" but Carmax sells "used cars" and Play It Again Sports sells "used sports equipment" so it does make some sense that there is a different model at play. For me, the analogy has a few holes in it. Personally, I can't really see the appeal. Other than a few specific products (like their cherry cider), I can usually find most things elsewhere, as good or better and at lower cost than TJ's. If one is wondering why Trader Joe's doesn't just enter the Canadian market it could be because Trader Joe's is owned by the Aldi supermarket chain, which itself two chains, Aldo Nord and Aldi Sud, each owned by different billionaire brothers. Aldi had carefully divided up the globe to avoid cross competition with the exception that in the United States branded Aldi markets are Aldi Sud and Trader Joe's is Aldi Nord. It could be that Aldi Sud was given the Canada upscale market and has just not entered it yet. Andi Nord would want to remove itself as a competitor. "Who own's" Really? I'm sadly getting used to folks tossing apostrophesaround willy-nilly when making a plural, but in a verb? What I can't figure out is why TJs hasn't seized on this as a marketing opportunity and has instead shot itself in the foot with most of the public. They should be out there with a US ad campaign about how their products are so good, Canadians are paying a premium to get them from Pirates "...but you don't have to." They should withdraw their suit, make peace with the guy, and work out an inventory plan with the Bellingham store to supply this guy with everything he needs. I'm sure it was listening to lawyers rather than the sales dept that got them into this trouble. I don't know that I agree with your take on this one, mainly because PJ's is selling merchandise that is at least technically used as new. If you're selling stuff as new merchandise with the original logo on it, it seems like it would be pretty easy to think there was some affiliation. I can sell my Mac if I want, but I suspect Apple would have a problem with me buying a 1000 of them and opening a store to sell them new. Your Ford/Prince analogy doesn't really work; in both cases, the resellers are not claiming used merchandise is new (except in cases where CarMax owns a new car dealership). Also, in the case of Prince I don't think they have their own stores. I agree property is yours to do with as you like after purchase, but if you claim it's something it isn't there might be a problem. The comments on this one should be interesting. Can any lawyers with expertise in this subject chime in please? Trader Joe's should not be mad. Mike Hallett has only increased Trader Joe's business without any added investment or risk on their part. 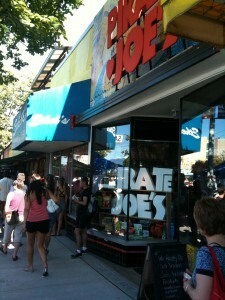 His successful store has only proven that there is a viable and lucrative market for Trader Joe's in Vancouver. Aldi Nord and Aldi Sued refers to how the Aldi Brothers split up German markets, not Noth American markets. I'm going to open a Pirate McDonalds, and resell McDonalds foods. Then I'm going to open a Pirate American Apparel, and only resell American Apparel clothing. Oh wait! This is a ridiculously dumb and illegal idea! This is clearly trademark infringement: he is using Trader Joe's trademarked brands to market to customers, and is making money on top of it. I think this is a perfectly valid suit. If he wants to profit from Trader Joe's trademarked branding, he should open a franchise. Is that not the ENTIRE point of a trademark? No business is safe if he can legally do this. The author also completely misses the point in his conclusion: the vendors listed are post-consumer resellers. Shoppers at Carmax or Play It Again Sports know that their goods were originally purchased from an authorized dealer. Ford controls its new car sales by selling to licensed franchises. If this guy can resell branded goods with no license or control, what stops him from duping customers with counterfeit, substandard, or tainted goods. And who would take the blame for this? The people with their name on the package: Trader Joe's. 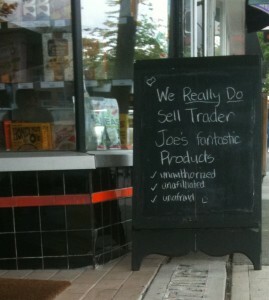 Trader Joe's doesn't have a presence in Vancouver. How can they claim trademark rights there? I don't recall any Trader Joe's in Canada. If thats the case, how can they lay a claim to trademark in that region? From a business perspective I see Trader Joe's upping Pirate Joe's legal expenses to the point where it doesn't pay to continue operations. All of the profits will go to the lawyers and Pirate Joe's will close. After all, PJs can only pass along his legal expenses to the consumer to the extent of what it costs the consumer to pay a visit to Seattle and buy the products directly there. I've noticed that many dry goods products from Trader Joe's are stamped "Made in Canada." I'm surprised Hallatt hasn't approached or attempted to locate said suppliers about another private label brand of similar product. That is unless he really is trying to benefit from the Trader Joe's brand. Authorized sellers of items are often restricted to the prices they can charge for their goods. Several purse manufacturers for example have sued stores for offering the purses at less than wholesale prices. This is no different. Now as to whether it is right or not, that would depend on your views. I personally have no issue with the retailers selling at a loss, nor do I have an issue with the wholesalers refusing to supply the stores in an attempt to "protect the image of their brand". I do not see this as a legal issue, or at least not one that should spend much time in court, if any. In this case I would agree, this is "used food" as it is being resold after being purchased at retail. In that case, it should be buyer beware. I would think the situation is very different. The retail purse stores get their products from the manufacturer, and so would have contracts limiting the prices the purses can be sold at. The Pirate Joe's situation would be equivalent to a customer buying a purse at a retail store which is later donated to a thrift store, and the manufacturer trying to dictate the price at which the thrift store can sell it. Kal and Chris, are you sure that Carmax and Play It Again Sports don't have some sort of agreement with Ford and Prince respectively to sell their products? In the Legal notice for Carmax, they do have a DMCA section, giving Ford and the like a way of notifying Carmax about trademark violations and giving Carmax a way of addressing trademark violation concerns. Presumably, if Ford is still allowed on Carmax, then either Ford has not noticed a trademark violation, or Ford and Carmax have some sort of agreement allowing Carmax to use the Ford brand name in selling products. Does Hallatt with Pirate Joe's have a way of resolving trademark disputes or permission to use the Trader Joe's trademark in a business identical to Trader Joe's? With yard sales and eBay, people are not setting up a business very similar to the original seller, and only changing the name. If Hallatt doesn't have permission, and doesn't give Trader Joe's a way of addressing trademark concerns, it seems the Courts was the only option left for Trader Joe's. Pirate Joe's has all the earmarks of a conceptual art project... vita tristis, ars comici.